On the beat there are, for conventional boats, always the best chances to improve their position, but also to worsen them. Doesn't sound quite logical but it is (at the moment) still so. You have considered your plan carefully – it is good, so trust it. Why would you want to throw all your resolutions overboard, just because your competitors try their luck somewhere else, and it looks good there at the moment? Things could change again in the next few minutes. Only modify your plan if you realise that the data on which you built up your strategy have changed. In this case, act quickly and without emotion. Develop a new plan and follow it consistently. Don't sail to where the best wind is! If you see a boat near you that is travelling at a good height and has more wind than you, the temptation is naturally great to sail over there. But resist the temptation, because it will bring you nothing. Usually you will have to sail a deeper course than your middle one, in order to get there, and in most cases the wind will be somewhere completely different if you have reached that wonderful place. There are several simple ground rules to watch here. If you plan a move against an opponent, consider well the possible advantages and disadvantages. Never lose sight of your goal. You want to win the race, or to come off as well as possible. 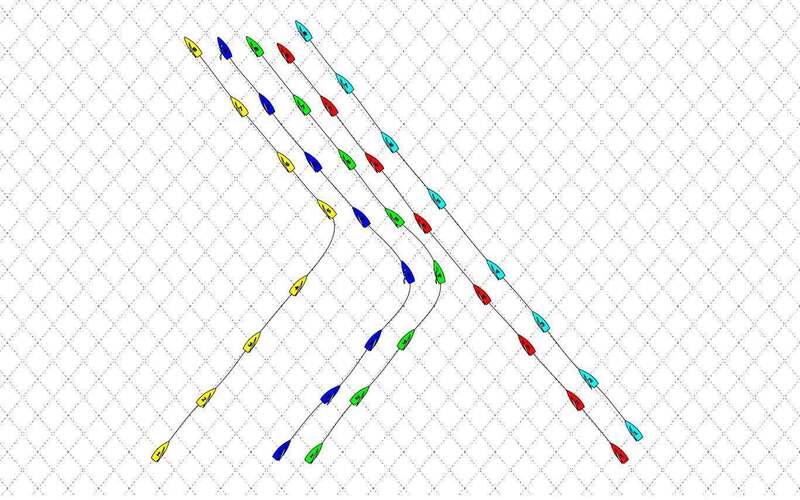 You surely don't plan to be at the windward mark before Boat X, and with it to arrive in the second half of the fleet. Do you actually know how long it takes until your boat reaches target speed after a tack? Practice tacking and the acceleration phase with a partner. In the seconds after a tack a precise sail trim is extremely important, in order to reach target speed as quickly as possible. You should know, in any wind and wave situation, how long it takes for you to get back to target speed again, and how much distance you lose with a tack. So – avoid duels as much as possible. If it is unavoidable, act quickly and consistently in order to carry out your strategy. The quicker you can make an attack, the quicker your opponent will recognise that there's no sense in messing with you and will leave you alone. Naturally, your chief aim is to carry out your strategy, however you can avoid unnecessary risks if you position yourself between the next mark and your opponents. This way, the risk of losing places because of an unexpected wind change can be minimised. Particularly if you see that the main fleet is following a different strategy to you, this tactic is a good compromise. If your strategy is working, you will still be ahead even if you lose a few meters. If the wind blows other than as expected, your loss will be small and you still have enough chances to make up places on the next leg of the course. 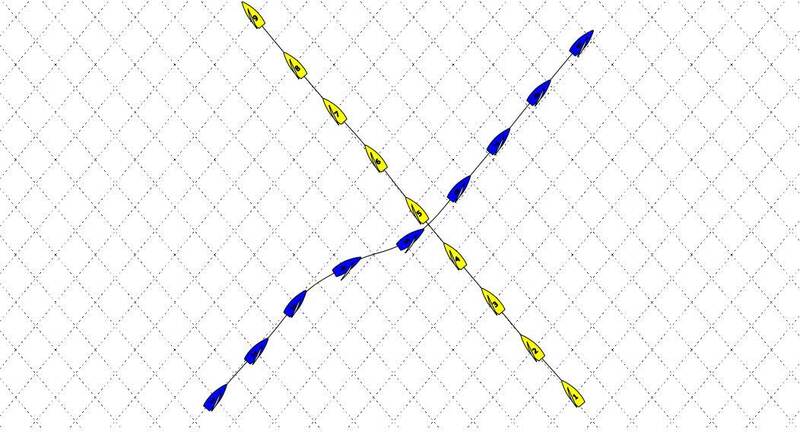 Particularly after rounding the leeward mark it can make sense, especially as the lead boat (or the lead boat in a group) to secure your position with two tacks. Maybe you have already discovered that the majority of the fleet is basically following the right strategy. Therefore, it is seldom sensible to move away from your opponents. Try to stay near them, but still to sail in free wind (good air). The greatest success is not the result of a great idea, but the result of many small correct steps. The progress lost because of a tack doesnt just consist of the path that you covered while you tacked, but also the loss of progress because of the many seconds you need, after a tack, to accelerate back up to your target speed. Naturally this differs from one type of boat to another. With a light dinghy, you will hardly lose any time with a tack. On the one hand its because, thanks to modern tacking technology, you can even accelerate during a tack/ while tacking. (But keep an eye on the racing rules while doing this). On the other hand, its because these small dinghies are also relatively slow on the close hauled course, and the progress made by the other boats while you tack is also relatively small. Its quite different with heavier yachts. For a 10 ton yacht to reach target speed after a tack can, even with optimal tactics, take half a minute. The situation with fast boats is different; in this case the other boats cover a great stretch, and the advantage because of this tack must be very great to balance out this distance. Particularly on the first part of the upwind leg we have always to try to stay in clear wind. In the picture on the left only the first boat has clear wind. The boat with the sail number 6 is directly in the wind shadow of the leading boat. Boat 2 is somewhat downwind of the leading boat, but still also gets the disturbed air in its sails. What does 'wind shadow' or more accurate 'bad air' actually mean? The real wind shadow of a boat is only very small and is only one of the disturbing effects which impact on the following boats. 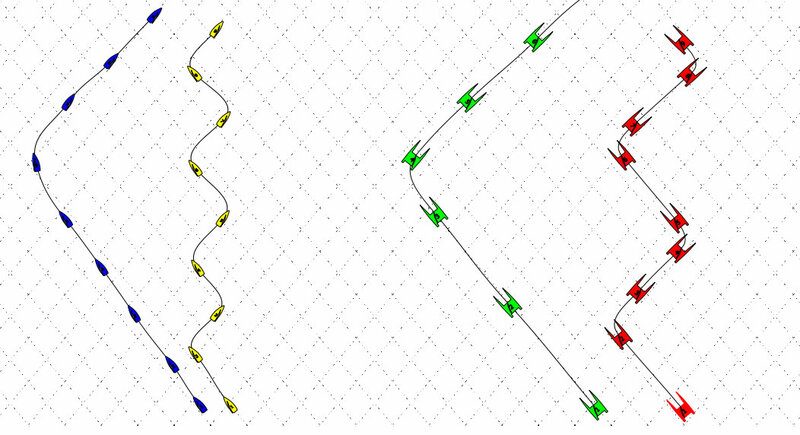 In the diagram on the right you can see what a disruptive effect a boat sailing in front of you has.In addition to the wind shadow all red boats are slowed down by the wash of the green boat. We try to get out of the disturbed zone as quickly as possible. 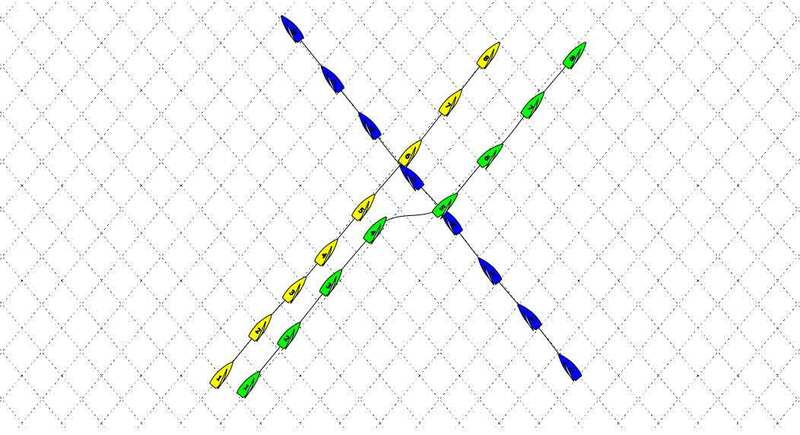 In the graph above, the two boats on the right have the option to tack and, with wind from port, to sail on the right hand side. The boat to leeward has the choice to sail a bit fuller to get away from the cover or to tack and to sail through, behind the other red boats. In this case there's a danger that one of the two boats to windward will also tack, and Red is then again in the bad air of the others. After the start, top priority must be to have free wind. At the same time we mustn't neglect our plan.. When boats meet on th ebeat there are many opportunities to act and react. If you are sailing on port and meet a boat on starport tack on a collision course, according to Rule 10, you must keep clear. 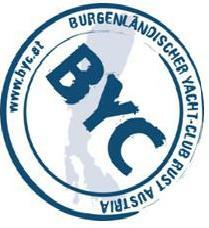 In this case you have the possibility to tack to leeward of the right of way boat, or to duck behind it. To pass behind it is often the better decision, especially with somewhat heavier boats, which lose a lot of speed when tacking, and need longer to come up to their target speed again. The green boat in the animation below has decided to pass behind the right of way boat. The right decision if his plan was to sail on the right hand side of the course. 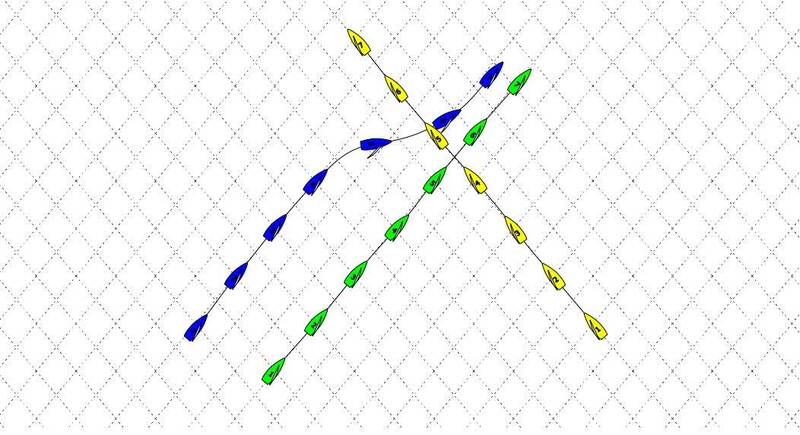 If the wind is blowing to the right, Green can tack and can easily make up for the small disadvantage it had compared with the blue right of way boat. The red boat actually wants to be on the left hand side of the course, therefore tacks in time and can in this way avoid the cover of the blue boat. The yellow boat has in any case made the wrong decision. It tacks to leeward of blue, but could not pick up speed fast enough and was heeled by blue. Now yellow would have to make a new tack again very soon to escape the bad air from blue. 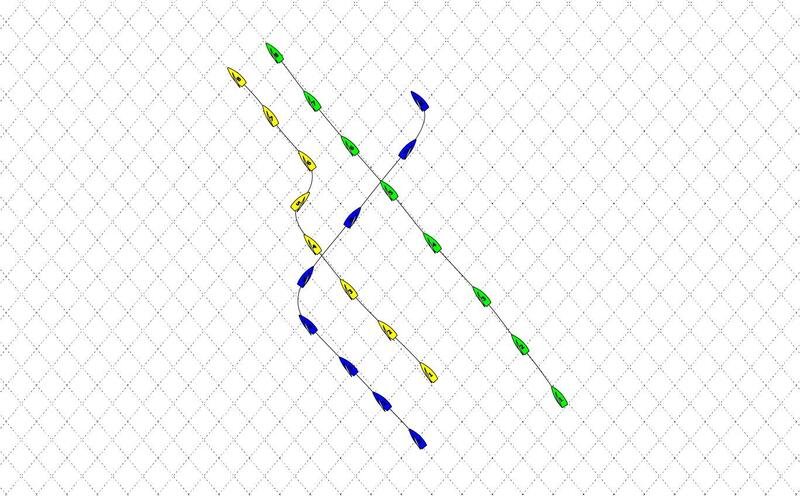 Due to the loss of speed caused by both tacks, yellow is at a disadvantage to all the other boats. 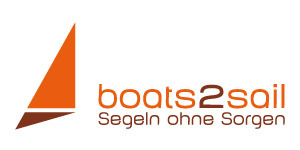 Both the following animations show that in certain cases it is better to give up your priority of right of way and to wave through the other boat. Red is, in this example, on a collision course with green and actually has right of way, but gives up its right and ducks through behind the back of green. By bearing away it gains in speed and after this manoeuvre is no longer in the wind shadow of blue. 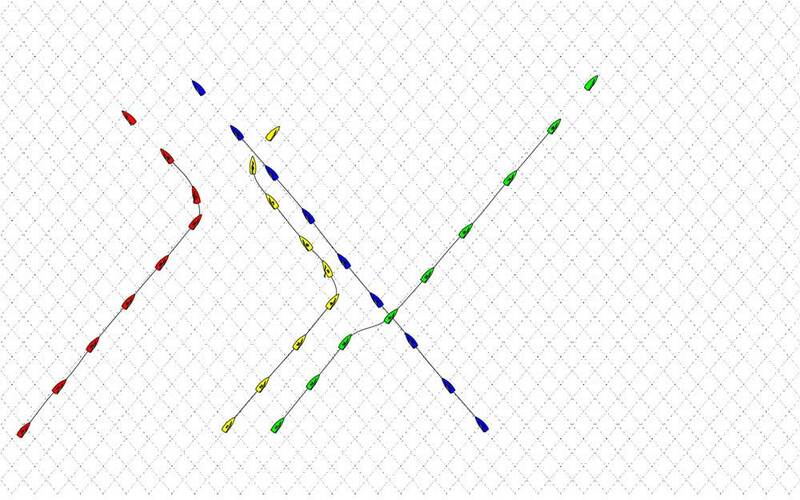 Also the transverse distance from blue is now so great that red now has a free choice either to sail further on starport on the left hand side of the course, or to tack on port and sail on the right hand side of the course. What could the alternatives have been? Red insists on his right of way. Green and, as a result, also Violet and Yellow tack as well. Now all of them are sailing on the side which Red preferred. Also, Red is so close to Green that it is hindered by the bad air and wash from Green. In addition, Red, because of its proximity to Blue, has no opportunity to tack and will fall further back. When Blue has passed by, it can tack, but is then under way on the side where it actually didn't want to be. Normally you have to sail a long distance before you have freedom to tack again. If, shortly after a leeward tack I reach the layline to the next mark, I have definitely done something wrong. Sometimes its better not to tack immediately below the opponents. That has several advantages: The yellow boat won't be hindered by me and so not forced to tack. That is a great advantage, because we have just already learned that it is an advantage to stay near your opponents. The blue boat has in any case the advantage to be able to decide for itself when it will tack and is not reliant on the co-operation of Yellow. If one decides to pass through behind a boat with right of way, one has to be careful not to land in the bad air of another boat by doing so. 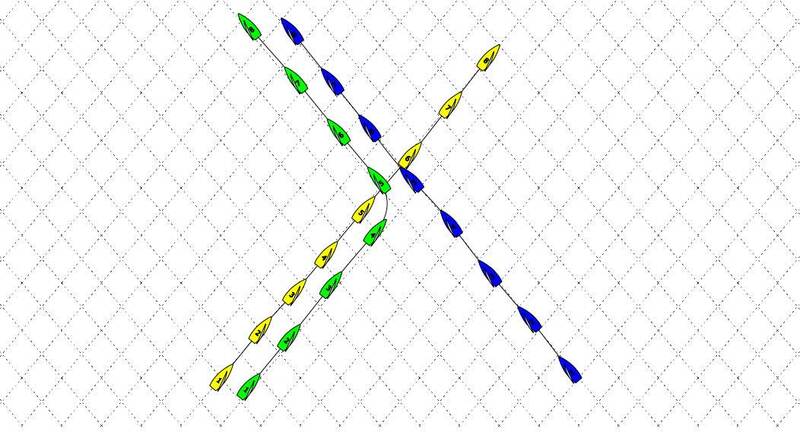 In the animation below Green reaches the safe leeward position in front of Blue and Blue will have to tack to starport and sail on the left hand side of the course – which was certainly not his plan, because if that had been his plan then he could already have tacked to leeward of Yellow. 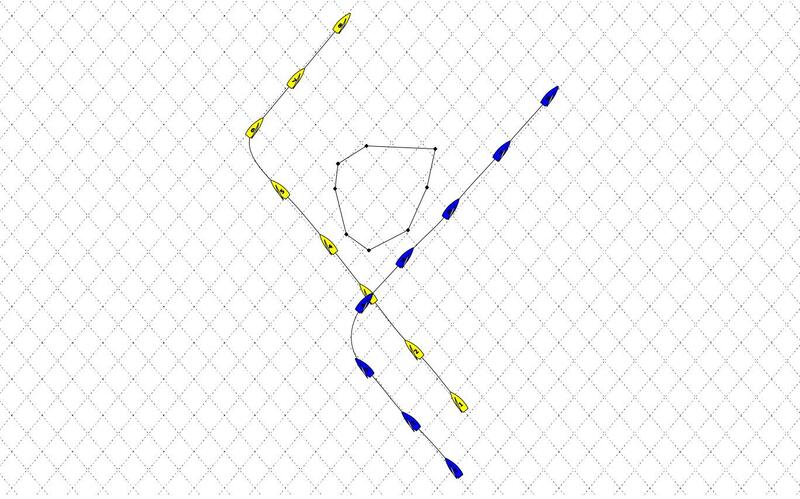 Because we suppose that Blue's plan was to sail on the right hand side of the course, the correct move would have been to reduce speed in order to sail through behind Yellow without losing any height (see next animation). If one wants to pass behind another boat, there are several possible courses to choose from. 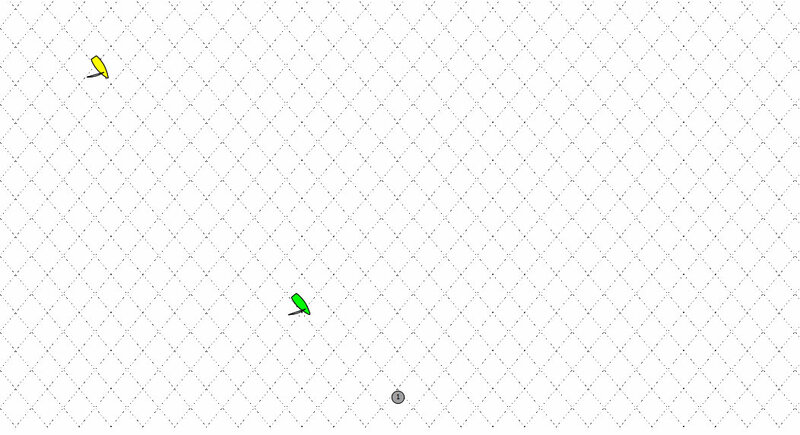 The following animation shows the optimal way to carry out this manoeuvre. 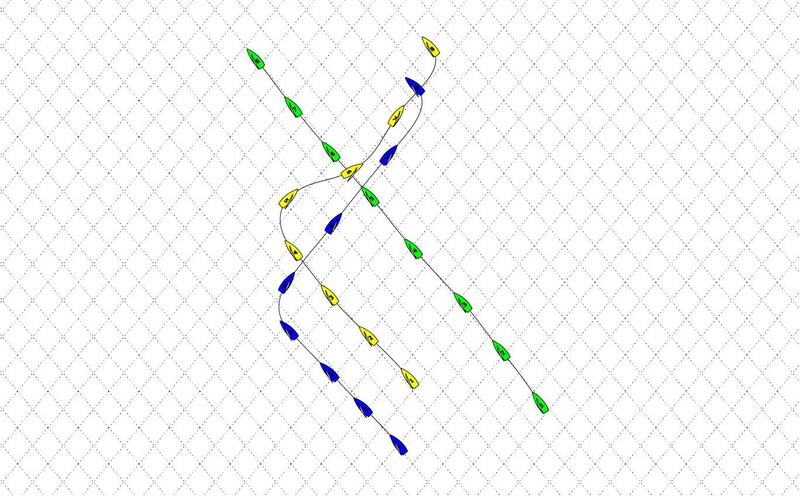 Blue bears away a little, relatively early, accelerates his boat optimally and goes onto the upwind course even before passing the stern of Yellow. 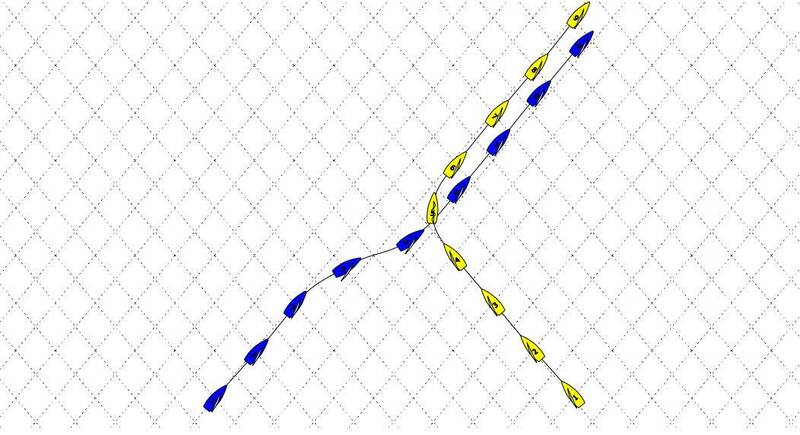 Through the acceleration gained by bearing away, after this manoeuvre, Blue will only lie only slightly behind Yellow. Blue's optimal course also carries risks. 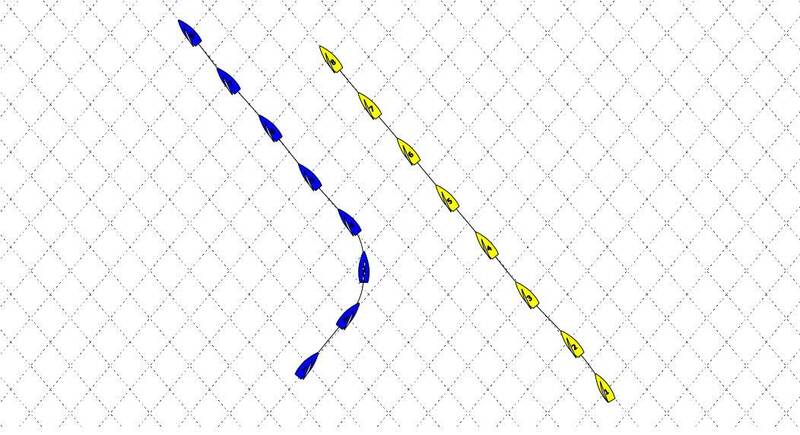 If Blue, as shown above, bears away relatively early, it could invite Yellow to carry out a tack and try to cover Blue. Particularly if the right hand side of the course is the best, or if Blue is a direct opponent of Yellow. We want to just briefly discuss the rules that should be followed in the following animation. At the beginning Yellow is sailing on starboard tack and Blue on port. Because the boats are on collision course, according to Rule 10, Blue has to keep clear, which it does by bearing away. 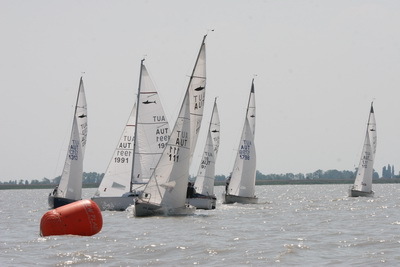 Yellow luffs to, and begins to tack (Situation 5). According to Rule 13, Yellow must keep clear during the tack. No problem – if Blue keeps to his deep course which will lead him past the rear of Yellow. The rules don't state anywhere that Yellow has to predict that Blue plans to go on an upwind course again. Because Rule 16.1. 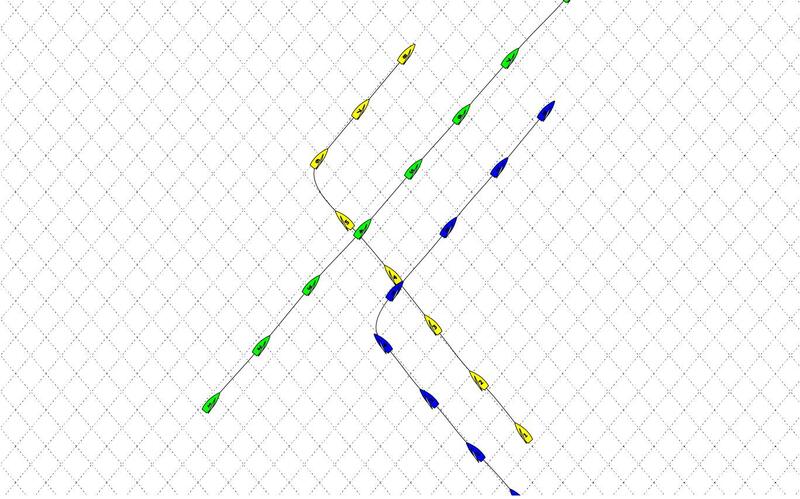 (Changing Course) Blue must keep clear, when changing his course to close -hauled. 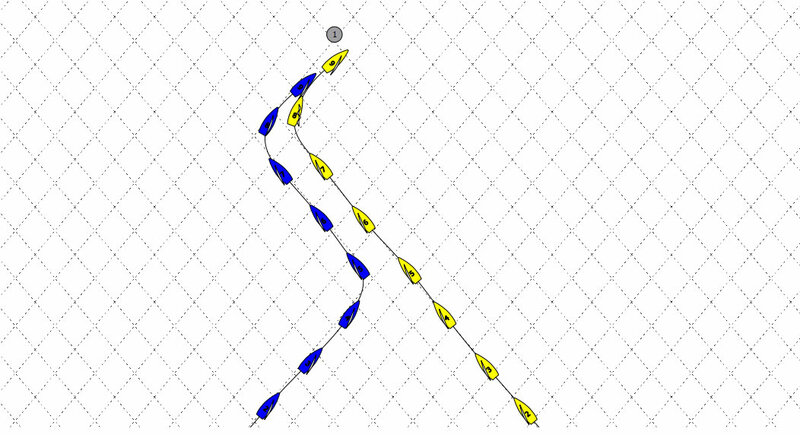 If there are good reasons to suppose that Yellow wants to move to the right hand side of the course, and is a good sailor, who masters his boat technically so well that he undertakes such a manoeuvre, you should choose the 'battle line' shown below, only bear away at the last moment, and duck through behind the stern of Yellow. This is not the fastest option, but the minor loss of progress is much better than to risk to be in the bad air after the tack of Yellow. Especially if we are already near the right hand layline when we make the manoeuvre and freedom to tack is a high priority for us. 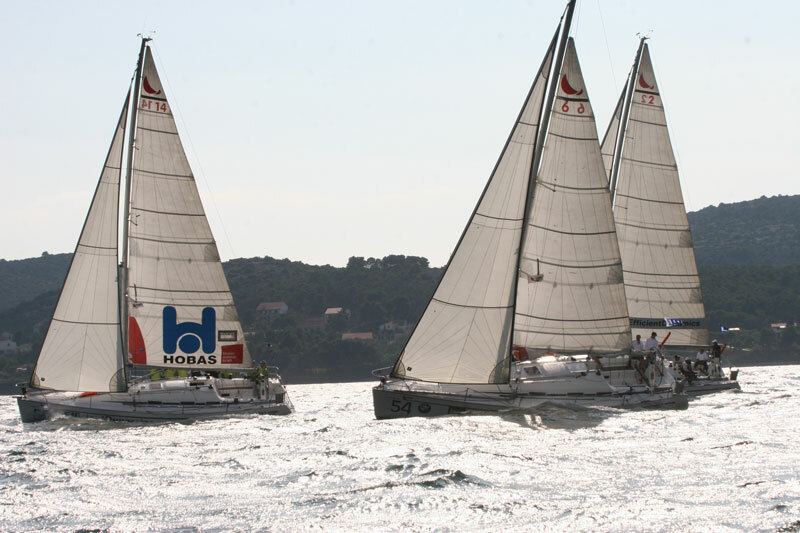 We know that, according to Racing Rules, boats with right of way are obstacles – in the sense of Rule 19. Yellow has to give way to Green and has, in this case, the choice between bearing away and crossing behind Blue, or to tack leeward of Blue. Green has to give Yellow enough room to avoid the Blue boat. In this example, Blue and Green are on collision course. According to Rule 10, Green must give way to Blue. Green can, according to Rule 19, demand room to tack. 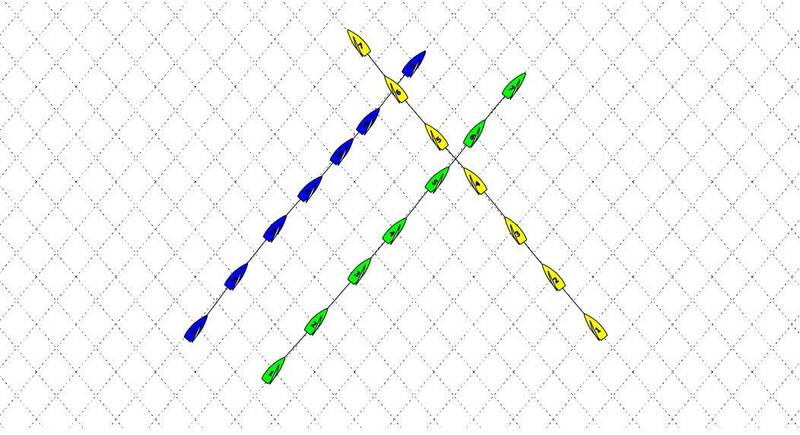 In the following situation Yellow wants to sail to the right, recognises however that Green could possibly demand room to tack, because of Blue. Yellow reduces his speed; this means Green tack to avoid Blue and Yellow can keep clear and pass behind Green, and now sail to the right uninterrupted, following his plan. 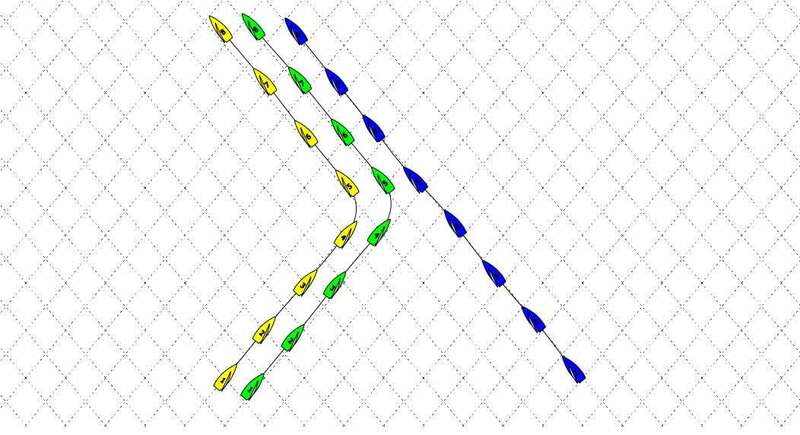 In the case that Green decided to pass behind the rear of Blue and then to sail to the right, it was still the right decision for Yellow to reduce speed a little – as you can see in the next animation. In this example, Yellow and Green are approaching on port, a boat which has right of way on starport. The starting position is the same as in the previous example. Both boats must bear away in order to pass behind Blue. Yellow still has some bad air from Green, so it uses the situation to gain more transverse space from Green. Yellow reduces its speed a little and manages to pass behind Blue without having to bear away. The important thing in this situation is that Yellow begins the manoeuvre so early that it can accelerate fully again before it passes the stern of Blue. After the manoeuvre Yellow can follow his tactical plan and is sailing now in clean air in the direction he has planned. In the chapter 'Fiedl tactics' we learned you should avoid tactical duels if possible. However, we know that not all our oponents read this site so closely as you. Also, you can have a situation where, at the end of a series, one of your competitors only has one more opponent, and that's you, because the gap in points to the next one is already too great to endanger him. In such a case it is naturally legitimate, and also covered by competition rules, that your opponent will try their hardest to get you to sail backwards. If you don't need an attractive race result yourself, you can achieve this aim best by closely covering your opponent. 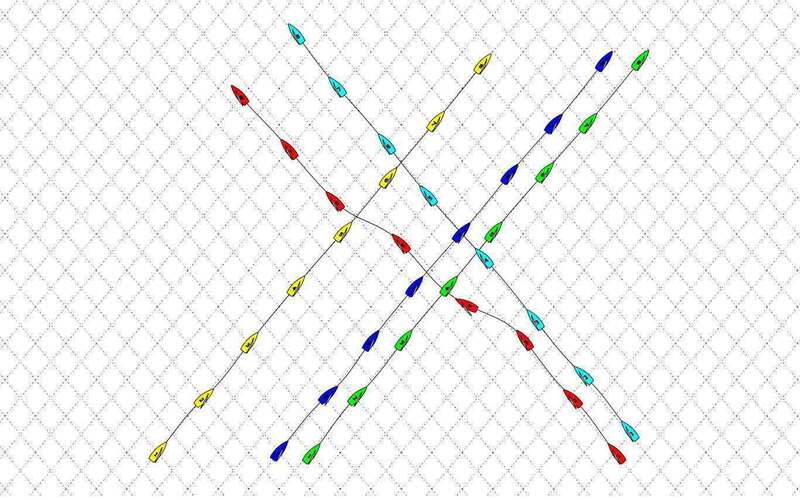 The most famous example of this tactic was the medal race in the Laser class at the Olympic Games in Qingdao, 2008. You will surely remember: Paul Goodison only sailed against the only opponent who in theory still had a chance of a gold medal. Goodison came 9th in the medal race and Rasmus Myrgen came 10th. As a result of this, Myrgen fell back from second to sixth place and the dream of an Olympic medal was over. Possibly he didnt reckon with a full attack from Goodison who only needed a second to last place in the race to win Gold, even if Myrgen had won this race. We want to show you next, what possibilities there are to escape from close cover. One possibility is to involve other boats in your tactics, and to escape the close cover that way. 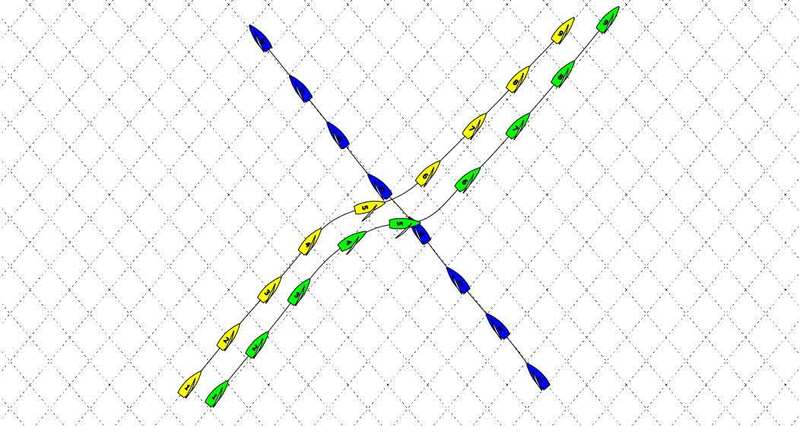 If boats with right of way lie to windward, like in the animation obove the green boat, you tack in such a way that the yellow boat after tacking also to continue our cover is now on a collision with the green right of way boat. Now yellow only has the chance either to make a tack in lee of the green boat and give up closely covering you, or like in the next, to duck behind the boat with right of way. In any case, he is now no longer directly windward of us and we have the chance to escape our opponent's cover with another tack. In any case, he is now no longer directly windward of us and we have the chance to escape our opponent's cover with another tack. Blue tacks in the moment when the yellow boat, if it also tacks would land in the cone of cover of the green boat. That way, our opponent is forced to sail further and we are free of his cover for the moment at least. Should he nevertheless tack, he will fall back quickly due to the cover of the green boat, and we will get rid of him that way. If there are islands or other large obstacles in the regatta area, you can let these very efficiently become part of your tactics. You let your opponent sail so far behind an island that his Layline, if he tacks, would take him through the island. In this case, his only possibility is to keep sailing and to stop covering you. You tack and pass the island on the opposite side. By clever positioning of the last tack you can even choose which side of the island you will pass and lure the opponent onto the 'worst' side. But be careful, it does not make sense to escape the cover of an opponent and to park in the shadow zone of an island. If there are no other boats or obstacles nearby, you have been dealt a bad hand of cards. In any case, if there was no good tactical reason for an opponent to cover you so closely, you should try to clear it up in a discussion with them after the race, because it is bad style to encumber another boat by a long time close cover. What does 'layline' mean? Boating.co.nz gives the the following definition: "The course on which your boat, sailing close - hauled on starboard tack, can just make a windward mark which is to be rounded to port is the starboard - tack lay line for that mark, and the most windward line on which you would approach the mark on port tack is the port - tack lay line". Assuming the next mark is the weather mark the layline is the exact line on which you must sail the last leg to fetch the mark sailing close - hauled. The angle between the starboard and the port layline is exactly the tacling angle. Because the wind seldom remains consistent, the layline changes constantly. If you sail direct on the layline, on starport to the next mark and the wind turns to the right, you could sail over the mark where you don't want to go. So, you just have the possibilty of slackening the sheets and to make up some of your lost progress with faster speed. You will understand that a boat which tacked below the original layline and now fetches the mark sailing close - holed is clearly at an advantage. 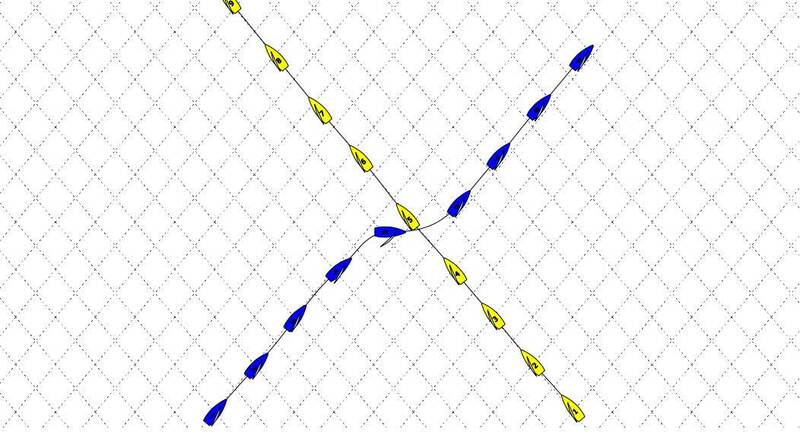 A further disadvantage; when you are approaching a mark on the layline, you seldom have undisturbed wind because a lot of other boats are also approaching the mark, either on the layline or just above it. Therefore the most important thing, when aproching a weather mark is avoid the lay lines. However, you have to be on the layline at some point as you approach the mark, but just don't do it too early. Try to predict the development and the decisions of your opponents and keep an eye on the rules applying for an approach to the mark. 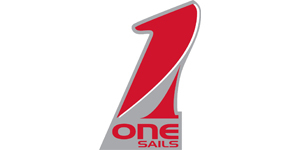 Whoever still sails up to the layline now is either sailing with a catamaran, with which the tacks take a suitably long time to make, or he has no trust in his tacking technique. Its often a good idea, especially if the gap between you and the next follower is quite large, to divide the amount of time you are ahead of them between two equally long tacks. That way, if the opponent rounds the mark you will find yourself directly between them and the next mark; a position where you can calmly await the next wind change.